A shop vacuum is a must-have piece of equipment for every garage. The amount of “stuff” that can be cleaned up with it is incredible. 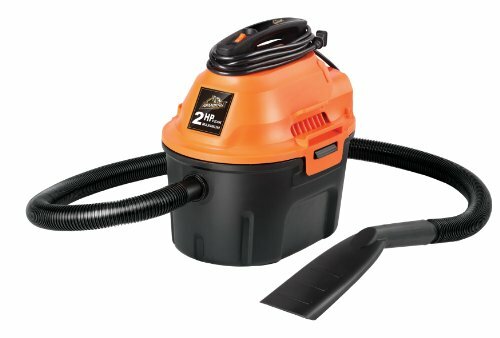 Shop vacuum uses range from sucking up potting soil, sawdust, spider webs, paint chips, and water to blowing away leaves to filling up inflatable pools. When a water pipe in the house has a leak, a wet/dry vacuum combined with a powerful air mover will make the situation a lot less stressful. When shopping for the best shop vacuum, the two most important features will be the tank size and the strength of the motor. Large tanks are popular in a garage or workshop environment, but those with small tanks are more versatile, especially if you have stairs to climb. The cord length can make or break a job, so shop for models that provide 10 feet or more. These highly rated shop vacuums were selected based on overall customer satisfaction, performance, and price. 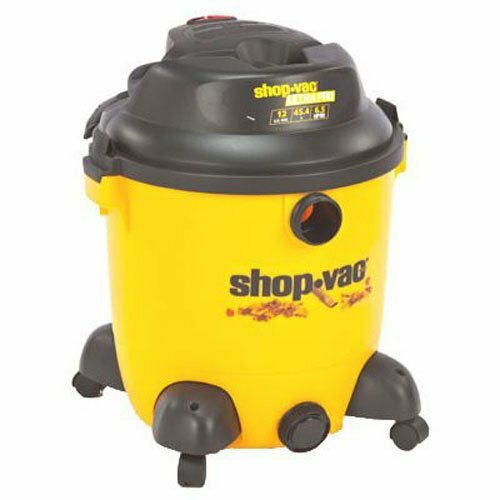 The Shop-Vac 9633400 is our #1 pick because it is ideally suited for the home, garage, or shop. You can use it for wet and dry spills and messes of any shape and form. You will appreciate that the 9633400 is small enough to take to job sites, but has a powerful 6.5 horsepower motor that will get the cleanup done quickly. The 18 foot cord will save you time swapping outlets or having to get the extension cord out, and is much longer than competitor’s models. Another thing you’ll notice about this model is the low noise. If you ever owned a shop vacuum before, you know just how loud they are. This model is one of the quietest shop vacuums you can find. To make your Shop-Vac 9633400 an even better bang for the buck, it comes with a detachable yard blower attachment. The blower works surprisingly well and is comparable to many gas powered units without the side effect of hearing loss. You can even use it to clean out the gutters using the 120-degree elbow attachment. The 12 gallon container means you can complete the job uninterrupted instead of stopping to empty the tank repeatedly. When the tank does get full, transporting and emptying the container is as easy as rolling it the garbage can and using the side and top handles to discharge. With a large assortment of on-board tools, the best in class Shop-Vac is really a great deal that will last you many years. 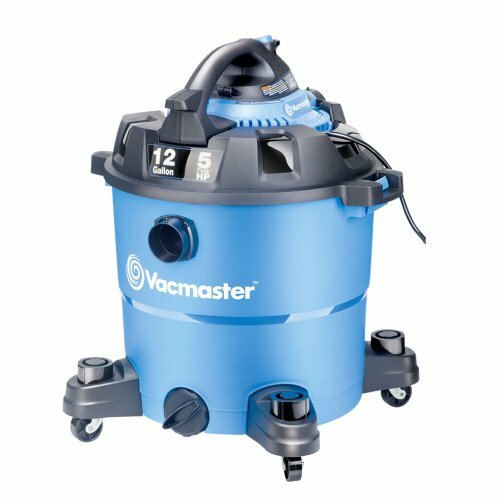 One of the best wet/dry vacs for your money is the bright blue Vacmaster VBV1210. It has a large, 12 gallon holding tank and uses a wide 2.5″ hose so it won’t clog up like older styles of wet/dry vacuums. You will get more for your money because this garage vacuum can be converted to a blower with the flip of a single switch. Blower mode is powerful and the manual’s recommendation to wear goggles is no joke. The Vacmaster is capable of moving air at up to 200 mph, and strong enough to move built-up leaves, dirt, and debris with its 5 horsepower motor. What’s surprising with all that power is how quiet a shop vacuum this really is. At the top of the unit is an over-sized switch which is equipped with a dust-seal, and it comes with a 2-year warranty if you do have a problem. The Vacmaster also includes a full set of tools and comes with a 12 foot cord (wish it was a bit longer). As the least expensive vacuum on this page, the ArmorAll AA255 is great if you need a smaller and lighter unit. You will not strain yourself lifting the 8.4 pound vac, and the 2.5 gallon holding tank will be perfect for small to medium-sized cleanup tasks. Keep in mind that its 1.25″ diameter hose will be prone to clog if you attempt to use it the same way as a much larger and more powerful unit. You can’t beat the AA255 when it comes to vacuuming out your car (even pet hair!) and taking it places where that larger models can’t go. The tank is topped off with a powerful 2 horsepower motor, and it comes with all of the attachments you need to get started right away. Designed with you in mind, it allows on-board storage of the attachments, and features and auto-shut off to alert you when the tank is full. If one of the units above might be a bit overkill, the ArmorAll AA255 is a great option for a good small to medium sized wet/dry vac. I love my Shop Vac. Still working great after 12 years but looking for something quieter. Brent – You’re not the first person I’ve heard of that has had a Shop-Vac for 10+ years. Both the Shop-Vac and Vacmaster models above would be great upgrades.